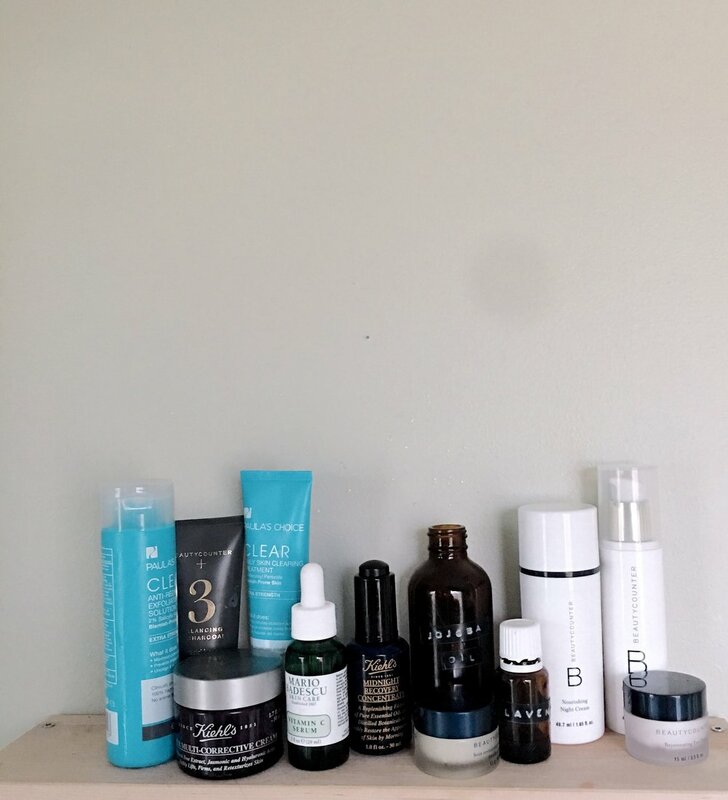 I've been working on this post since SEPTEMBER and finally pressed the publish button...I love all things skincare and I've been itching to share you my favorite products. Let me begin by saying please don't be overwhelmed by this list haha! Most of you know I'm all about embracing a minimal lifestyle -- a lifestyle that I have adopted in all areas except in this particular one (and books too if I'm being honest). If you are simply a soap and water kinda girl be thankful and OH how I wish I could be like you! Unfortunately my skin repels anything that is low-maintenance. Before we dive in, here's some background on my skin: It's oily in the summer, dry in the winter, and sensitive year round. It is a magnet for blackheads and white heads, so exfoliating is a priority for me. If I don't wash my skin every morning and each night I will wake up with all kinds of mountain ranges on my face. I have struggled with acne since I was 12 (particuarly hormonal). When I say acne I don't mean the occasional redness or pimple...I'm talking about serious cystic acne that was embarrassing and painful and gross. I had to go on Acutanne twice and even that didn't help in the long run. So how did I clear it all up? Somewhere down the road I learned what products worked for me and what didn't (and all the things from the drugstore caused my skin to worsen!). I then invested in products that worked well, took supplements that supported healthy skin, and tried my best to be consistent with them. First up, I remove any makeup with a witchazel toner and my eye makeup with jojoba oil. Then I cleanse using my clarisonic and nourishing cleanser from Beautycounter. The Clarisonic has been my weapon of choice since college and I love how clean it makes my skin feel after each wash. I use it morning and night and I absolutely notice a difference in my skin's texture and clarity whenever I use it. It's important for me to exfoliate regularly because I get clogged pores and white heads easily. As for the cleanser...Y'all. Beautycounter lives up to they hype. It has completely changed the texture and tone of my skin and I have sworn my loyalty to these products until the day I die. And if you think that's dramatic then I dare you to try them for yourself. For those who haven't heard of BC, it's a company who is passionate about healthy skin and bans over 1,500 questionable ingredients from their skincare and makeup lines. This is extremely attractive to someone like me who is passionate about healthy living in all areas of life. I truly believe that plants heal. Yet, every time I've attempted to trade in my traditional skincare products for more natural ones, I've been disappointed, Nothing seemed to work...and a lot of the "natural" stuff even made my skin worsen. Then, my friend Lisa sent me some BC samples to try and it was game over. My husband (my HUSBAND mind you) even commented on how great my skin looked after I started using them. I discovered (after a lot of trial and error and dermatologists visits) that I need a combination of salicylic acid and benzoyl peroxide to keep acne-causing bacteria far far away. I don't know where I would be without the Paula's Choice CLEAR line. It has saved my skin! I use both the extra strength exfoliating toner and the skin-clearing treatment morning and night. I found the face wash in this line to be too drying for me, so I prefer using the one from Beautycounter instead. To give my skin that extra glow, I use Kiehl's Midnight Recovery oil every night and a vitamin C serum every other night. I use the Mario Badesco vitamin C serum and I've been really pleased with the results -- a lot of old acne scars have begun to fade and my skin feels super soft the next morning. If I have a mac-daddy pimple, then I put a little dot of Mario Badesco Spot Treatment and it dries it right up. Full disclosure, this doesn't fall into the "natural" skincare category. But it has been the only thing that has worked for my acne and so I continue to use it for that reason. If (when?) I discover a natural product that works as well as this does, you will be the first to know! Finally, I use a moisturize for the morning and night. The acne treatment dries out my skin so it is important not to skip this step! I have fallen head-over-heels for the BC restorative moisturizers and let me tell you, these products have given me a babies bottom in exchange for a face. I also use the BC eye cream morning and night to help with my puff pastry under-eyes (#twokids) and to prevent signs of aging. Once a week I use the a charcoal mask (also from BC...notice a trend here?) and it has been the first mask that not only WORKS but doesn't break me out. Finally, I like using this vitamin E oil for an added moisture boost in the winter months.